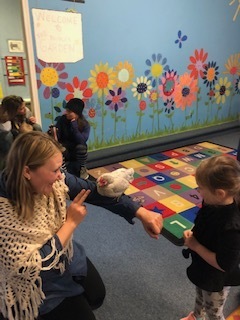 Quiver Farm visits Saint Faith! On Monday, Farmer Tom introduced us to Max and Ruby, the chickens. We got to pet Ruby and she was so soft! The farmer told us all about the eggs and how we should take care of them so that they all hatch into healthy chicks. We should have some chicks hatching starting Monday. The 100th day of school was so much fun! The students, teachers and parents worked on activities and crafts to celebrate. Due to weather predictions, AM classes and Lunch Bunch are canceled tomorrow. PM starting at 12:30 Kindergarten at 11:00. We will keep an eye on the weather if we have to cancel PM. Due to weather predictions, AM classes and Lunch Bunch are canceled. PM starting at 12:30 Kindergarten at 11:00. Be safe. We will be closed tomorrow, Weds. Feb. 20th due to the impending forecast calling for significant snow. Due to the worsening weather conditions school will be closed today. St Faith morning classes and Lunch Bunch will be canceled on Tuesday, February 12th, due to inclement weather. Kindergarten will report at 11:00. Full day children are welcome at 12:30. St Faith morning classes and Lunch Bunch will be canceled on Monday, February 11th, due to inclement weather. Kindergarten will report at 11:00. Full day children are welcome at 12:30. All are welcome to St. Faith’s Preschool and Kindergarten’s Open House on Wednesday, January 16th. Kindergarten Coffee Morning 9:15-11:30 am. in the Undercroft. Parents will be able to observe the Class and a teacher will be available to answer questions. Preschool and Kindergarten 6-7 pm. (adults only). Parents can tour the school building, visit classrooms, teachers will be available to answer questions. In House Registration begins on January 22nd and for new families on February 4th at 9:00 am.